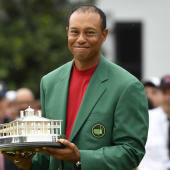 Yes, golf still exists following Tiger Woods' 2019 Masters win. There is still a PGA Tour event to be played, and another champion will still be crowned this week to possibly get into next year's Masters. The show must go on. So let's take a look at this week's RBC Heritage event as the post-Masters portion of the golf calendar moves on. Dustin Johnson (8-1): Was that the quietest T2 by a top-two player in the world in Masters history last week? Bryson DeChambeau (18-1): He almost won here the last time he played well at Augusta, too, in 2016. Tommy Fleetwood (20-1): I love the schedule Tommy Lad is playing. He'll crush here. Kevin Kisner (25-1): Coming off that WGC-Dell Technologies Match Play win and consistently plays great on this course (which suits his game given its lack of length). Xander Schauffele (18-1): He honestly might be the lesser Brooks Koepka, which doesn't engender confidence in a non-major, but I can't help myself. Webb Simpson (25-1): Finished T5 at the Masters and T5 here last year. Shorter course will help him. Jim Furyk (30-1): Will be rested from having last week off. Won here in 2015 and 2010. Patrick Cantlay (20-1): Two straight top 10s here. Francesco Molinari (14-1): They could be playing literally any course this week and he would be in my top 10. Jordan Spieth (20-1): I said this after Augusta, but I'm so impressed by the grind. At some point, it's going to click. I don't want him outside my top 10 when it does. Field strength -- B: For the week after a major, though, it's an A+ field. 1. Harbour Town's greens: They're the smallest on the PGA Tour. That means proximity to the hole will be important for scoring and that chipping around the greens will also be important for keeping rounds together. Bet on great iron players and good scramblers this week. 2. Luke Donald has five runner-up finishes here: I didn't include him in my power rankings because he's No. 595 in the world right now, but he's maybe the biggest horse for any course in PGA Tour history without actually winning the tournament. 3. Go deep on Sunday: Here's a fun little nugget from the PGA Tour: In each of the last six years, the eventual winner has trailed the 54-hole leader by three or more. Be wary of golfers way down the leaderboard on Sunday. Winner: Tommy Fleetwood (25-1) -- I could be way off here, but I just have a feeling his first one is coming this week. He's great around the green, great approaching the green and didn't expend a lot of energy at the Masters last week because he wasn't in contention. Fleetwood gets his first PGA Tour win this week. Top 10: Patrick Cantlay (20-1) -- Should have a ton of confidence following his showing last week, and he's been a surgeon on this course. One of the elite ball-strikers in the game. Sleeper: Luke Donald (60-1) -- Contended at the Valspar Championship a few weeks ago, and his historic record (see above) speaks for itself. In any other tournament he'd be 100-1 or more, so you'll have to pay for it, but I still think there's value there given his success here.